PUBG has come from nowhere to be one of the biggest games in the world. 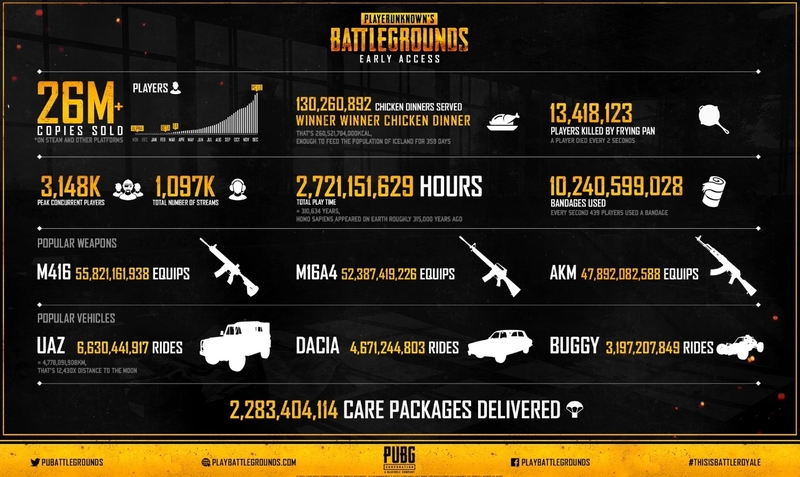 PUBG Corp. has released a new infographic that highlights some astounding numbers from last year’s early access period of PlayerUnknown’s Battlegrounds. Spanning from the end of March with its original release on Steam early access all the way through to the end of December when the game achieved a full release, the numbers show just how massive PUBG was in 2017. One of the more stunning stats is that the total play time in early access alone reached over 2.7 billion hours, which works out to 310,634 years of PUBG gameplay. That’s a whole lot of landing, looting, and shooting. Over 130 million chicken dinners were awarded during early access. That equals out to enough food to feed the population of Iceland for 359 days. It turns out the frying pan was way more than just a “Level 4 Armor” in the game, as 13.4 million players were killed by the melee weapon. That means someone died to it every two seconds. The peak concurrent player count of over three million was well documented—but there were also over one million streams of the game, making it the most-watched title on Twitch in all of 2017. There’s no doubt that 2017 was the year of PUBG, but 2018 continues to see improvements to the game. PUBG Corp. continues to battle hackers and cheaters, hoping to improve the experience for players new and old.